Departing Beijing for Pyongyang. Air Koryo flies a small fleet of new and old airplanes, all Russian-made. I flew on an Antonov AN-148. Overall the flight was just fine - the plane was by no means brand new, but it ran just fine, and the flight was comfortable. From Wikipedia: The An-148 aircraft is a high-wing monoplane with two turbofan jet engines mounted in pods under the wing. This arrangement protects the engines and wing structure against damage from foreign objects (FOD). A built-in auto-diagnosis system, auxiliary power unit, high reliability, as well as the wing configuration allow the An-148 to be used at poorly equipped airfields. From the gate in Beijing, I was transported by bus out to the aircraft, which was parked on the tarmac. The wide open tarmac boarding scene gave some great views of air operations in Beijing, as well as a good look at the somewhat unusual AN-148. Departing Beijing for Pyongyang. 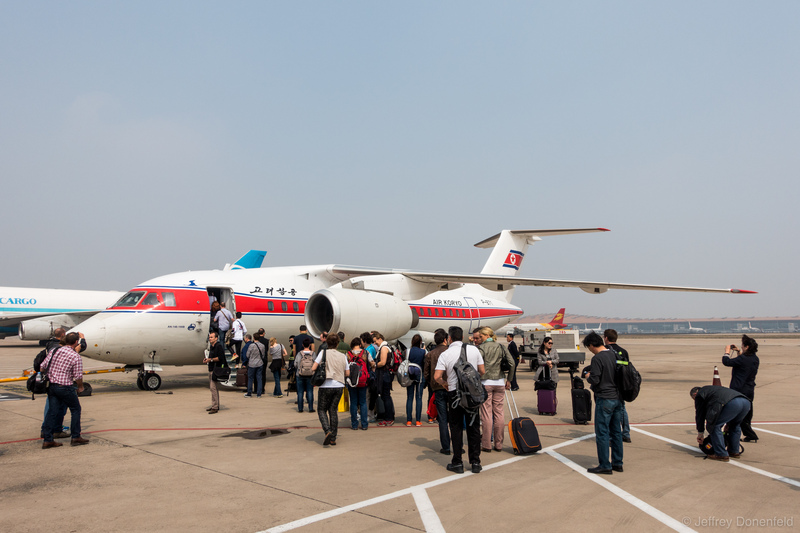 Air Koryo flies a small fleet of new and old airplanes, all Russian-made. I flew on an Antonov AN-148. Overall the flight was just fine – the plane was by no means brand new, but it ran just fine, and the flight was comfortable.